In ALOHA, a thermal radiation Level of Concern (LOC) measures the threat associated with releases that are on fire; a thermal radiation LOC is a threshold level of thermal radiation (heat), usually the level above which a hazard may exist. When you run a pool fire, jet fire, or BLEVE (Boiling Liquid Expanding Vapor Explosion) scenario in ALOHA, thermal radiation is the hazard that is modeled. The thermal radiation effects that people experience depend upon the length of time they are exposed to a specific thermal radiation level. Longer exposure durations, even at a lower thermal radiation level, can produce serious physiological effects. 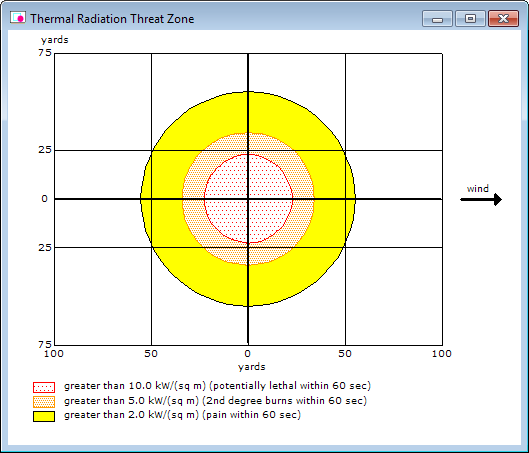 The threat zones displayed by ALOHA represent thermal radiation levels; the accompanying text indicates the effects on people who are exposed to those thermal radiation levels, but are able to seek shelter within one minute. If you model a pool fire scenario in ALOHA using the default LOCs, your threat zone estimate will look similar to the one pictured below. The red, orange, and yellow threat zones indicate the areas where the thermal radiation is predicted to exceed the corresponding LOC at some time after the release begins. If you prefer, you can enter up to three thermal radiation values of your own (rather than use the default values). On the Thermal Radiation Level of Concern dialog box, simply choose "User specified" from the drop-down list of LOC values and type in your own LOCs. When setting your own LOCs, you may want to refer to the table below. Federal Emergency Management Agency, U.S. Department of Transportation, and U.S. Environmental Protection Agency. 1988. Handbook of Chemical Hazard Analysis Procedures. Washington, D.C.: Federal Emergency Management Agency Publications Office. Note: The durations that correspond to effects like pain or second-degree burns can vary considerably, depending on circumstances. The effects above were observed on bare skin that was exposed directly to the thermal radiation. Some types of clothing can serve as a protective barrier against thermal radiation and can affect the exposure duration. However, exposure duration should be kept to a minimum, even at low levels of thermal radiation.